In 2007, I posted two articles on this site suggesting that cancer had something to do with the energy mechanism of the human body. I am coming back to this through a comment on one of those articles by Viorel Bungau, a family medical doctor in Romania. Could cancer be a functional deviation of the cellular energy production mechanism that is open to correction by relatively simple means instead of a genetic mutation that is passed down through cell division? Heinrich Kremer, MD, says that this is indeed the case. His hypothesis of a photon-mediated cellular energy pathway may turn out to substantially add to our understanding of what cancer is, and why such natural substances as curcumin may be effective cancer fighting agents. Could cancer be a result of the functional degradation of a cellular photon absorption pathway that is basic to the production of ATP, the cellular energy molecule? And could tumor cells merely be executing an age-old survival program they retained from the time of unicellular existence? An interesting new hypothesis of cancer causation spells out why some cells all of a sudden start dividing to form tumors, and how that urge to sustained growth could likely be 'switched off. I am passionate about cancer research. After years of study, we came to a hypothesis to be verified experimentally in collaboration with a field center. After many attempts (direct approach), no one has agreed to do this experiment. Please help make this research proposal possible. If proven true, it would change the medical approach to diagnosis and treatment of cancer and beyond. I want to promote energy assessment by Energo-Electro-Photography in cancer to generally become a diagnostic method, and rebalance energy irradiation with light color (color therapy). Please get involved in this project as a scientific leader. Nobody has a definite opinion about this theory. Please examine this hypothesis and facilitate an experiment, under your auspices. The idea that the final biological oxidation is a process of oxidation-reduction with electron transfer and photochemical process with energy transfer (selectively, based on complementary colors), is the only explanation for the Warburg effect and aerobic glycolysis. Therefore I think that must be confirmed experimentally, and will aim to get involved in this research, as a scientific leader. I am a family doctor, and do not have access to a research center in the field. Electronegativity is a nucleus of an atom's ability to attract and maintain a cloud of electrons. Copper atom electronegativity is higher than the Iron atom electronegativity. An atom with lower electronegativity (Iron), removes the atom with higher electronegativity (Copper) from combinations. This means that, in a conditions of acidosis, we have cytochrome oxidase with iron (red, neoplastic), instead of cytochrome oxidase with copper (green, normal). I think this is the key to carcinogenesis. "Duality of cytochrome oxidase. Proliferation (growth) and Differentiation (maturation) of the cell." 1.- Form acidic (acidosis), which contains two Iron atoms, will be red, will absorb the additional green energy of the hydrogen atom, derived from carbohydrates, with formation of H2O, a metabolic context that will promote cell proliferation. 2.-Form alkaline (alkalosis), containing two copper atoms, will be green, will absorb the additional red energy of the carbon atom, derived from carbohydrates, with formation of CO2, a metabolic context that will promote cell differentiation. According to the principle of the electronegativity of metals, under certain conditions of acid-base imbalance (acidosis), iron will replace copper in combination, cytocromoxidase became inactive (it contains two copper atoms) leading to changing oxidation-reduction potential, AND THE COLOUR CHANGES FROM BLUE-GREEN TO RED, to block the final biological oxidation and the appearance of aerobic glycolysis. Final biological oxidation, the production of CO2 and H2O, should be reconsidered in the sense that a distinction must be made between the oxidation of carbon and hydrogen oxidation. In the case of carbon atoms, cytochrome oxidase must have an alkaline chemical structure, to be colored green and so it can absorb additional red energy carbon atoms derived from carbohydrate. For the oxidation of H atom cytochrome oxidase must have a acidic chemical structure, to be colored red, and so it can absorb additional green energy hydrogen atom derived from carbohydrate. We imagine an experiment to prove that in final biological oxidation, in addition to a process of oxidation-reduction, to form H2O and CO2, there is a photochemical effect, whereby the transfer of energy from the atom H or C atom, is made selectively by color on the principle of complementary colors. Structures involved in this process are colored (red hemoglobin Fe, Mg chlorophyll green, blue ceruloplasmin Cu, Fe cytochrome oxidase red, Cu cytochrome oxidase green etc). 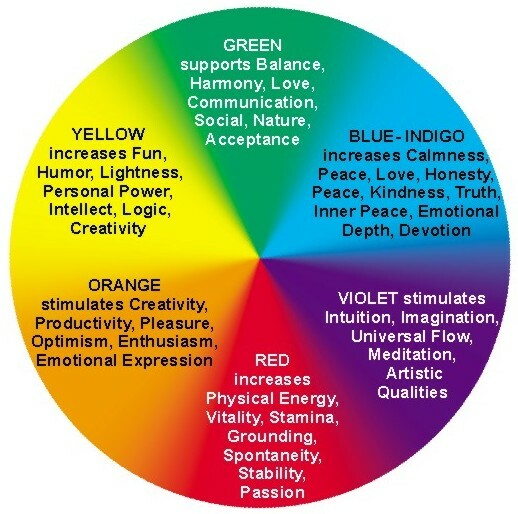 The basic idea is that if life pigments (chlorophyll, hemoglobin, cytochromes), which provide the energy metabolism of the cell are colored, we can control their activities through chromotherapy, on the basis of complementary color and energy rebalance of the body, with a figured X-ray colors. CULTURE OF NEOPLASTIC TISSUE, IRRADIATED WITH MONOCHROMATIC GREEN LIGHT, IN AN ALKALINE MEDIUM, WITH ADDED COPPER, WILL RESULT IN REGRESSION OF THE TISSUE CULTURE. CULTURE OF NEOPLASTIC TISSUE, IRRADIATED WITH RED LIGHT, IN AN ACID MEDIUM, WITH ADDED COPPER CHELATOR, WILL RESULT IN EXCESSIVE AND ANARCHIC GROWTH OF NEOPLASTIC TISSUE CULTURE. "Inner Light - Light of Life." (Correlation between the chemical structure of the cell (body), and type of energy that can produce and use). In connection with my research proposal, to prove that in the final biological oxidation, in addition to an oxidation-reduction process also takes place a photo-chemical process, the first in the electron transfer, the second in the energy transfer. In my opinion, at the basis of malign transformation is a disturbance of the energy metabolism, which reached a level that the cell can not correct (after having succeeded before, many times), a disturbance that affects the whole body in different degrees and requires correction from outside starting from the idea that the final biological oxidisation takes place through a photochemical process with energy release. If the structures involved in the final phase of biological oxidation are colored, then their energy absorption is determined based on the principle of complementary colors. If we can determine the absorption spectrum at different levels, we can control energy metabolism by chromotherapy - EXOGENOUS MONOCHROMATIC IRRADIATION. Energy absorption in the biological oxidation process itself, being based on complementary colors, the structures involved (cytochromes), are of the nature of porphyrins, which in combination with a metal become colored. They will absorb the complementary color corresponding to a specific absorption spectrum, it will be in - ENDOGENOUS MONOCHROMATIC IRRADIATION. Malignant transformation occurs by energy metabolism imbalance in power generation. In the predominance (exclusivity) of the hydrogen atom, carbon oxidation is impossible. Thus at the cellular level this will produce a multiplication (growth) exaggerated (exclusive), energy from hydrogen favouring growth and multiplication, at the expense of differentiation (maturation). Differentiation, which is achieved by energy obtained by oxidation of the carbon atom can not take place, leading to carcinogenesis. In the energy metabolism of the cell, an energy source is carbohydrate degradation, which is done by OXIDATIVE DEHYDROGENATION AND OXIDATIVE DECARBOXYLATION, to obtain energy and CO2 and H2O. In normal cells there is a balance between the two energy sources. In cancer cells, oxidation of the carbon atom is not possible, the cell being forced to summons the only energy source available, that of hydrogen. This disorder is underlying malignant transformation of cells and it affects the whole body, in various degrees, often managing to rebalance the process, until at some point it becomes irreversible. The exclusive production of hydrogen energy will cause excessive multiplication of immature cells, without functional differentiation. Exclusive carbon energy production will lead to hyperdifferentiation and hyperfunctionality, where multiplication is impossible. The normal cell is between the two extremes, between some limits depending on the adjustment factors of homeostasis. Energy from energy metabolism is vital for the cell (the whole body). If the energy comes predominantly (or exclusively) by oxidation of the hydrogen atom, green energy, at the structural (biochemical) level, there will be acidification of the cellular structures that will turn red, so WE HAVE MORPHOLOGICAL AND CHEMICAL STRUCTURES "RED", WITH "GREEN" ENERGY. This background predisposes to accelerated growth, without differentiation, reaching uncontrolled, anarchical levels. THE ENERGY STRUCTURE OF THE CELL BODY WOULD BE YIN. If the cell derived its necessary energy mainly by oxidation of the carbon atom, red energy, cell structures will be colored green, will be alkaline (basic), so WE HAVE MORPHOLOGICAL AND CHEMICAL STRUCTURES "GREEN", WITH "RED" ENERGY, in accordance with the principle of complementarity. This context will lead to hyperdifferentiation, hyperfunctionality, maturation, and growth stops. THE ENERGY STRUCTURE OF THE CELL BODY WOULD BE YANG. I want to experimentally demonstrate that an energy metabolism disorder that could be corrected after several times by means of maintaining acido-base balance within normal limits, has become irreversible by depleting these resources. Acid-base balance and its adjustment are the mechanisms underlying this disorder. "Life balance: Darkness and Light - Water and Fire - Yin and Yang". Cytochrome oxidase structure has two atoms of copper. It is known that in conditions of acidosis (oxidative potential), through the principle of electronegativity of metals, copper is removed from combinations of the Iron. So cytochrome oxidase will contain two atoms of iron instead of copper atoms, which changes its oxidation-reduction potential, but (most important), also changes its color. If the copper was green, the iron is red, which radically changes its absorption spectrum, based on the principle of complementary colors. In neoplastic cells, because acidosis is overactive, we see the acid form of cytochrome oxidase (red with iron atoms), which will absorb the additional green energy hydrogen atom (exclusively). There is the production of H20, so water will prevail. In Schizophrenia, the neuronal intracellular alkaline environment will promote the basic form of cytochrome oxidase (green with copper atoms), which will oxidize only carbon atoms, there is energy absorption of red (complementary) and production of CO2, so the fire will prevail. Drawn from this theory is an interdependent relationship between water and fire, between hydrogen(H2O) and carbon(CO2) , in a controlled relationship with oxygen (O2). A body with cancer disease will become chemically color "red" -ACID- (as evidenced by laboratory), and in terms of energy, green (Color-Energo-Photography). A healthy body will be in terms of "green" -Alkaline- (as evidenced by laboratory), and in terms of energy, red (visible by Color-Energo-Photography). "Green" body with alkaline chemical structure, is connected with Carbon energy C = O (carboxilic acids), red energy, from oxidation of carbon atoms derived from carbohydrates. "Red" body with acid chemical structure, is connected with Carbon non-energy C-OH, (non-energy, phenolic acids, with strong oxidising activity, prone to multiplication), and green energy, which comes from oxidation of hydrogen atoms derived from carbohydrates). I want to promote energy assessment by Energo-Electro-Photography (Full body scanner) in cancer to generally become a diagnostic method, as well as rebalance energy irradiation with light color (color therapy). Please get involved in this project as a scientific leader.